You prayed, made calls, sent letters, wrote blog posts, op-eds and many emails. Now it’s time to celebrate! Americans deserve an Attorney General who will enforce the rule of law regardless of their political or personal opinions, and that is exactly what newly confirmed Attorney General Sessions has promised. Go ahead, take a moment. It is good to see a good man like Sen. Jeff Session, sorry, actually, U.S. Attorney General Jeff Sessions (sounds good doesn’t it?) overcome the unprecedented smear campaign from the left we witnessed and come out victorious. This is just the latest example of what we can do when we raise our voices and work together. We rejoice not only for his personal victory but also because this is a victory for all Americans. The Department of Justice (DOJ) is in desperate need of a leader that refuses to put politics ahead of the law. Politics have ruled for the last eight years of the Obama Administration. Still today, former Attorney General Eric Holder is plotting to undermine the Trump Administration’s DOJ. 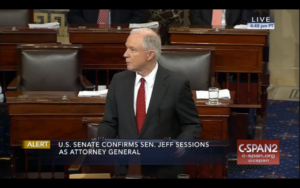 AG Sessions’ task will not be easy, so he will continue to need our prayers going forward. But for now, we take a moment and simply smile.